Finding A Kitten: What To Do? | Sav-R-Cats International, Inc.
Kitten season is upon us! With our year-round mild weather, kitten season is never really over, but spring is an especially busy time. 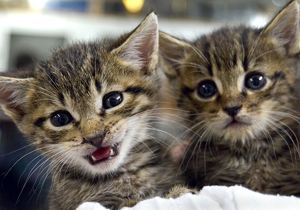 We get many calls of people finding kittens…but what is the best thing to do if you find a baby? Well, the answer is maybe not what you think it is. If the baby is not in danger, the best thing to do is wait and watch. Why? The mother may be off hunting or may be in the process of moving her kittens in her mouth, one by one. This means she may leave her babies unattended for up to hours at a time. So, you need to wait hours, or even up to a day, to find out if the kittens is truly on its own. If you do discover that it’s on its own, and take the kitten in, keep in mind that baby kittens require round the clock care. Between bottle feeding every few hours, burping after meals (yes just like a human baby!) and needing help going to the bathroom, by taking the kitten in, you are essentially becoming its surrogate mom. If you do find out that there is a mom in the area, once the kittens are old enough to not need to nurse off the mother, getting her trapped, spayed and released as soon as possible is the best thing you can do. And then, do the same when the kittens are big enough. This will help prevent a repeat of the current situation and will also make for healthier, happier cats. For more information on low–cost spaying and neutering, please give us a call. This entry was posted in News on March 9, 2018 by savrcats.